Hi everyone! This is part one of my Poshmark guides - check out my Poshmark tips for buyers. This time I’m focussing on selling on Poshmark for beginners. Advanced sellers - I’ll be writing a post with advanced tips for you in the future, so watch for it! In my opinion, the Poshmark app is the easiest way to sell your unwanted clothing and accessories. If you haven’t used Poshmark before, use code “eseward7” when you sign up to get $5 off your first purchase. * The concept is the same as a consignment store, but online instead of a physical store. You snap a picture of the item you’d like to sell, fill in some information (category, size, brand, color, etc), add a title and description, choose your price, and then it’s available for someone to buy! Here are some basic tips to help your items sell faster. 1. Share Share Share! On Poshmark, people can “follow” your closet if they like items you post. Any time you share an item, it shows up in the home page feed of anyone that follows you. Therefore, the more you share, the more your items show up when people that follow you are browsing. You can also share other people’s items to your followers. It is good Poshmark etiquette to share someone’s item if they share one of yours. Therefore, the more you share other people’s items, the more they will share yours. When someone shares your item, it means your item shows up in the feed of hundreds or thousands of people who wouldn’t normally see it. In addition, when someone goes to share an item of yours, they end up looking at your closet. While they browse your closet, they might find something they like enough to buy! 2. Share to parties. In general, the Poshmark app hosts 4 parties per day. In the morning/around lunch time (12pm-2pm eastern) there is a party limited to specific brands. In the afternoon (3pm-5pm eastern), there is a party limited to one or two specific categories. In the evening (7pm-9pm eastern), there’s a party usually targeted at a specific demographic of shoppers: mens clothing, childrens, plus, petite, etc. In the late evening (10pm-12am eastern), there’s a party where you can share any item (you should share all of your listings to this one!). Take note of these parties and try to make sure to share any of your listings that fit the party theme. Normally when you share an item, it goes to the feeds of your followers. When you share an item to a party, anyone who browses the party feed can see your listing, even if they do not follow your closet. Sharing to parties exposes your listings to a lot more people than just sharing to your followers. 3. List everything that is in good condition that you never wear or use! You never know what items people will want. Maybe you don’t like an item, but someone else might see it listed in your closet and fall in love and decide to buy it! That exact scenario has happened a lot with me. Sometimes I list a stack of items, and the first thing that sells is the thing I was sure would never sell. Make sure everything that you list is in good condition - no holes, rips, stains, or overly worn items. 4. Think about how to price items. Right off the bat, Poshmark takes 20% of the selling price of every listing that sells, so you’ll only get 80% of the listing price. In addition, Poshmark has a feature that allows buyers to make an offer. Different sellers have different philosophies with prices. Some list items at their absolute lowest prices, and never entertain offers or drop the price. Other people purposely list for a little higher than their target price so that they have wiggle room when people make offers or so that they can drop the price at a later time. Decide which method works best for you. 5. Decide on your “let it go” price. We all have those items in our closets that we never wear, but can’t bear to get rid of. Try to look at these items and see if you have a “let it go” price. For example, I used to have this jacket that I loved but never wore. I didn’t want to take it to the consignment store because I knew I wouldn’t get more than $20 for it, and for that price, I’d rather keep it. However, if someone offered me $40 for it, I would’ve sold it. One day, I decided to list it on Poshmark for $50. I knew it was priced a little high, but I was fine keeping it if it didn’t sell. A few weeks later, it sold for $50, which meant I got $40 after Poshmark took 20%. I was comfortable giving up the jacket for $40. The nice thing about Poshmark is that you have full control over the prices of your items. Listing things at my “let it go” prices has helped me finally clean out items that took up space in my closet for prices I was comfortable with. *Signing up for Poshmark with the code “eseward7” gives you and me each $5 in Poshmark credit - a win-win! Today was the first in-store preview day for the Lilly Pulitzer After Party Sale (APS). If you haven't already, don't forget to read my APS guide! Tomorrow (Sunday January 5th) is the second and final in-store preview day, and the online sale goes live on Monday at 8am EST. Today I visited two different corporate stores. I was one of the first people in one store at 9am, and I was at the second store by 9:45am, so I saw almost everything that was available. The picture above shows everything I bought at both stores combined. Full disclosure - I wasn't just shopping for myself! Below is each item that I bought and the price. These same items should be online Monday morning for the same prices. To see other items that were part of the sale, check out the "APS Preview" highlight on my Instagram, "Escolorfulcloset". 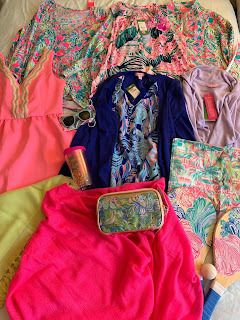 Lilly Pulitzer only puts sale items on their website twice a year - once in the late summer/early fall, once around/after New Years Day.These sales are called the After Party Sale. Lilly Pulitzer does not announce the sale dates until a few days before. The next one will be Monday, January 7 - Tuesday, January 8, in stores and online. There are two "early access" days in store only - Saturday, January 5 and Sunday, January 6 (here's my haul from the preview day I went to!). The sale goes live on the first day (Jan. 7) at 8am EST, and there is a virtual line to get into the website (it’s THAT popular! ).The sale ends around 11:59pm on Jan. 8. Shipping can take up to 6 weeks after the sale.As an After Party Sale veteran, today I’ll be sharing the tips I’ve learned over the years. Hi everyone! 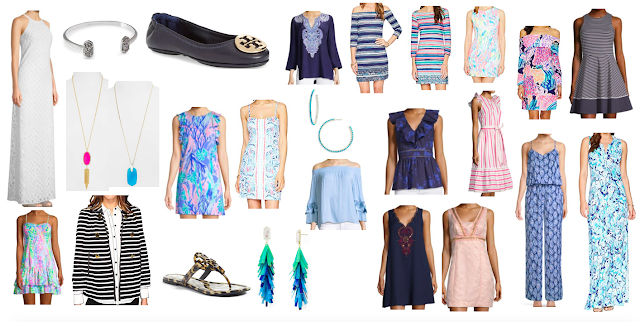 Today I'm posting a round up of some sale Lilly Pulitzer, Kendra Scott, and Kate Spade items that I've come across while browsing Pre-Back Friday sales. Enjoy!